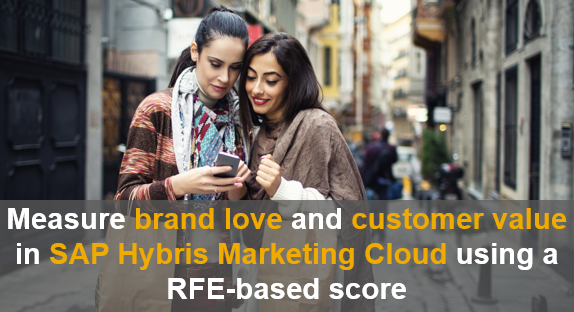 Scores can be used in SAP Marketing Cloud to quantify customer behavior. Apart from data-driven predictive / machine learning scores, it’s also possible to setup heuristic scores. Such rule-based scores are typically defined based on company policies or best practice. The score logic is built explicitly through calculations and rules. This blog will outline an implementation of a complex heuristic score based on a variation of the industry-proven RFM (recency, frequency, monetary) model. In the literature, the RFM analysis is a technique to quantify which customers are the most valuable customers. The most valuable customers are determined by examining how recently they purchase (Recency), how frequent they purchase (Frequency) and how much they spend (Monetary). Recency: How recently did the customer interact? Frequency: How often did the customer interact? Engagement: How valuable are the interactions the customer did? Using this broader RFE definition, we can also quantify how loyal and engaged a customer is. Every customer receives a value between 1 (least loyal and engaged) and 5 (most loyal and engaged). 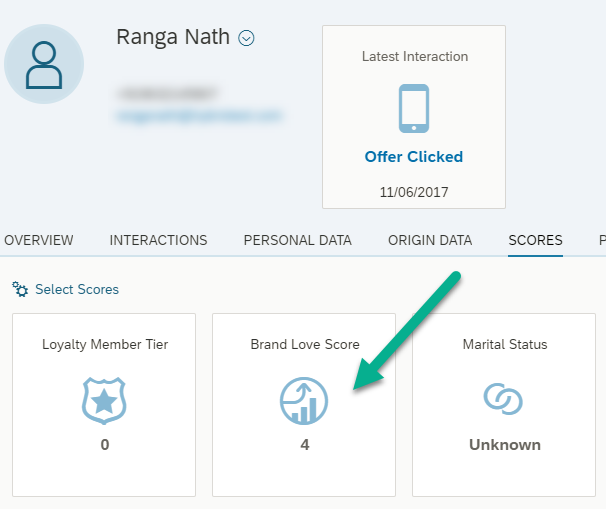 As with every other heuristic score in SAP Marketing Cloud, they can be used in the segmentation or displayed in the contact details / factsheet for individuals – here, the resulting score has been called “Brand Love Score”. 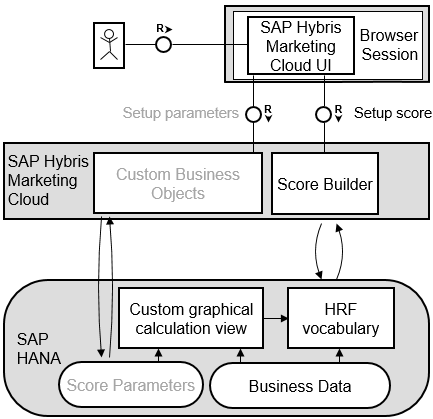 With SAP Marketing Cloud, heuristic scores are created using the Score Builder app. Using multiple rules, several conditions can be checked. A rule is valid if all conditions are met. The final score value is calculated as aggregation of the outcomes from all valid rules. This illustration shows the technical architecture of a score, whose HRF vocabulary has been extended by a custom graphical calculation view. Through the HRF vocabulary, business data can be used directly or via the custom graphical calculation views. Our implementation of the score is done by implementing the RFE-specific (recency, frequency, engagement) logic in the underlying HANA views. 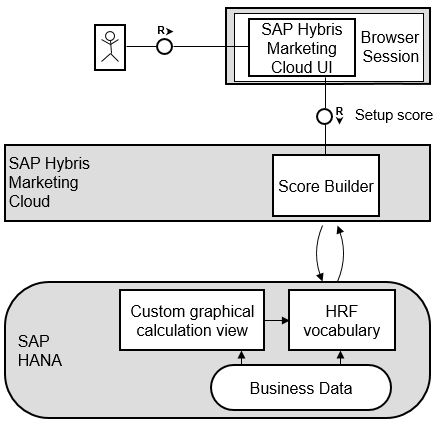 In a nutshell, the HANA view calculates intermediate results and the score builder uses these and provides the final score value to the SAP Marketing applications such as the segmentation or the consumer profile. An exemplary calculation done by our score is illustrated below. For a given customer, his/her behavior can be categorized by the three dimensions recency (divided in five time buckets on the x-axis), frequency (divided in five frequency buckets on the y-axis) and engagement (illustrated by the value shown on the chip, representing single interactions). The most current time bucket is on the left hand side of the x-axis and the bucket with the most interactions is on top. In this example, four interaction types have been identified by the business to be relevant for the RFE analysis: Website visits, product/service reviews, surveys and registrations. These interactions have a different impact on the engagement value (e.g. survey = 75, website visit = 15). However, you can identify from this example that although the registration interaction (on the right side) has a quite high interaction value (100) the actual effect (0.25) on the score (67.25) is quite low. Intentionally, because the customer registered a while ago, it’s effect on the score gets lowered. The generic HANA view which implements this calculation could look like the one below. The intermediate results per time bucket (R1-R5) are calculated individually and later summed up in the top aggregation node. This calculation is done for all relevant interaction types (e.g. visits, review, survey and registration). Another HANA view takes the results per relevant interaction type and calculates the final result. Using this concept, each customer can set up it’s own version of the score based on their business/industry. 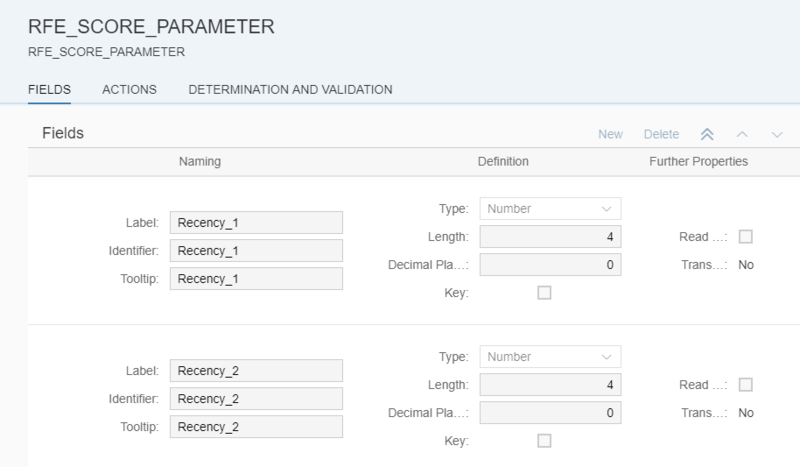 As Fiori applications can be generated for the maintenance for Custom Business Object data, the task of setting up the parameters can be fully done in the SAP Marketing UI. It’s also possible to adapt the values at any point in time later. As heuristic scores are (in the default setting) calculated in real time, the adapted parameters are also immediately taken into account. In the HANA view the configured parameter values can be used as input parameters for the underlying logic. In this screenshot, YY1_03F588E6A526 is the technical name of the DB table which got generated for the CBO and the columns are used here as input parameters. The illustration below shows the final technical architecture. The HRF vocabulary of the score is extended by a custom graphical calculation view. The view itself does not only take business data but also the score parameters for the final calculation into account. 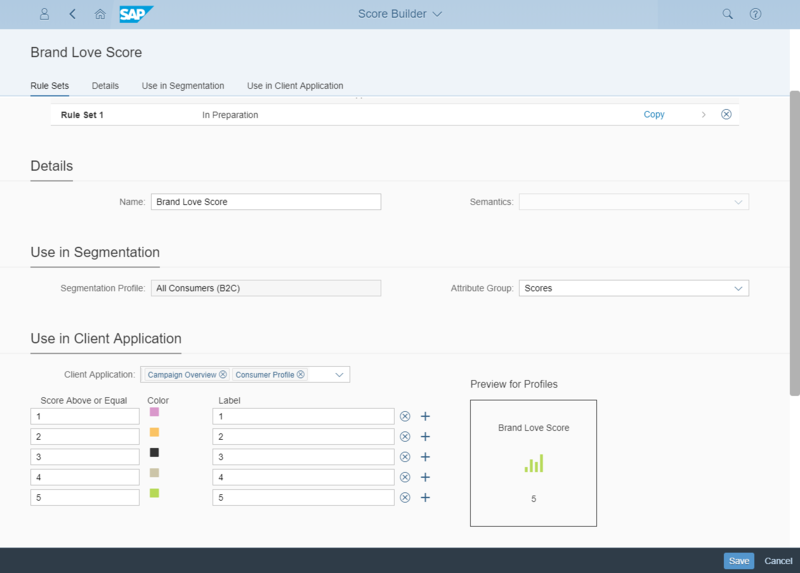 The maintenance of the score parameters can happen on the UI via a Fiori application which can be generated for the CBO. After the custom business objects for the score parameters and the custom graphical calculation views for the score logic have been setup, the standard procedure to extend the HRF vocabulary applies. This procedure is well described in the Extensibility Guide for SAP Marketing Cloud. 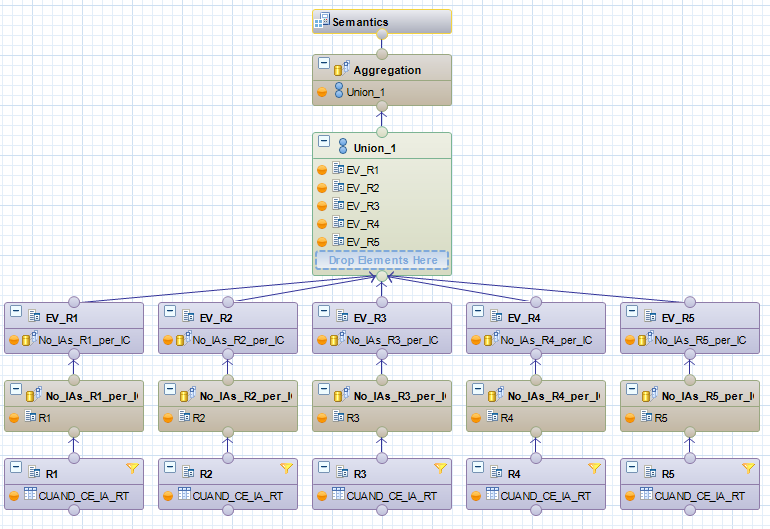 The very last step of the setup is the score itself which consumes the results from the HANA view. As the HANA view already returns the score value directly in the format [Contact_Key; BrandLoveScore], we don’t need any additional logic in the score builder. Of course, depending on the business requirement, the custom attribute can be used in a condition with standard fields as well. The score can then be made available for the usage in segmentation and in other applications such as the consumer profile. Our algorithm comes with best practice parameters to calculate the score. If you are interested in more detail in the score implementation, don’t hesitate to contact us, the Expert Services Marketing Practice. The score has already been implemented at several customers, mostly from the consumer products and retail industries. As described, every customer can adapt the parameters for their business/industry and markets.